The Sunda Flying Lemur (Galeopterus variegatus), also known as the Malayan Flying Lemur or Malayan Colugo, is a species of colugo found throughout South-East Asia. In Singapore, it can be found in the Central Catchment area. At night when it is in search for food, it can glide across the forest canopy. This because it has a gliding membrane that connects from the neck, extending along the limbs to the tips of the fingers, toes and nails. Hence the name, flying lemur although it is neither can truly fly nor a true lemur. During the day it is often found resting. I have seen this species previously at Lower Peirce. This time around I manage to see it in February 2012 at Bukit Timah near the visitor centre. It was clinging on to a palm tree. The flying lemur was clinging on the lower part of the palm tree, so it was easy to position myself closer to it. It’s looking warily at the people gathering to see it. It decided that it needs to be up higher, so it started climbing. You can see just how flexible the membrane is. As it climbs, particles fall down from the tree on the left side, and you can now see it elongating it’s body further. As it reaches the top, I walked to the side to photograph the other part of the animal. You can see why it was wary of human. It has a baby in it’s membrane’s fold, with it’s head jutting out in curiosity. The baby can take up to six month to be independent from the adult. During this time, it clings on for protection and food. This entry was posted in Mammals, Wildlife and tagged Bukit Timah, Colugo, Sunda Flying Lemur on June 6, 2014 by Francis Yap. Two months ago, I was at the Lower Peirce reservoir looking for a Buffy Fish Owl that was mentioned by other bird photographers. Unfortunately, my timing was all wrong as owls normally come out in the late evenings and I was there in the mid afternoon! Walking along the boardwalk, a fellow visitor noticed that I was carrying my long lens and mentioned to me that there was a flying lemur near the other part of the entrance. Carrying such a big contraption does have it’s benefits! I did not respond immediately as I was pre-occupied with photographing other stuff. Later, I met another photographer who was there taking pictures of bulbuls (another kind of bird) bathing. He was an older gentleman who started chatting with me and later showed me around where the owl was suppose to be. As we walked along, he pointed to each location and what we may see along the way. Yet another visitor who had two kids tagging along again saw that we had long lens and mentioned that they just saw a flying lemur. One of the young kid, a boy offered to take us to that location. Of course we tagged along. How can we disappoint a young kid? 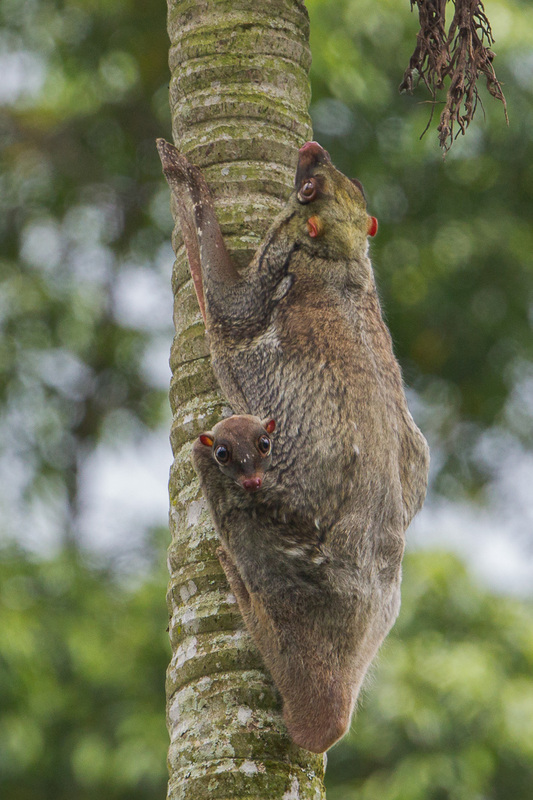 At the location, hugging on one of the tree motionless was indeed a flying lemur or colugo. And it came with an extra head peeking out of it’s belly! A baby colugo. Apparently the colugo young spends the first 6 months of its life clinging on to its mother’s gliding membrane which folds up to a pouch. Colugos are found in the tropical rainforest of South East Asia. They are nocturnal herbivorous creatures that spend the day resting. In this case, by hanging on to a tree. Their most distinctive feature is their ability to glide across treetops, using their outstretched gliding membrane. They are also known as Flying Lemurs although their are not lemurs and certainly cannot really fly. In Singapore, they are found mainly in the Central Catchment area which encompass the Lower Peirce reservoir area. Since these photos were taken, there have been quite a number of sightings of these creatures, so I believe they are thriving for now. This entry was posted in Mammals, Wildlife and tagged Colugo, Flying Lemur, Lower Peirce on October 19, 2010 by Francis Yap.